China has promised a massive package of loans and aid to Middle Eastern nations, while US influence in the region is seemingly fading. Analysts discussed with RT whether Beijing has more in its sights than just economic interests. Xi, speaking at a meeting with Arab League nation representatives in Beijing, heralded an "oil and gas plus" plan to pour Chinese money into the Middle East. It will include $20bn in loans for projects in countries with reconstruction needs. Apart from that, China will give $90 million in humanitarian and reconstruction aid to war-torn Syria, Yemen, Jordan, and Lebanon, and $15 million to Palestine. China has been trying the waters in the Middle East for years now. Stunted by the Arab Spring, its efforts were then given new impetus by the 2013 announcement of the Belt and Road initiative – an epic trade route project to connect China, Africa, and Europe with a string of ports, railways, roads, and industrial parks, going in part through the Middle East. The world's most energy-hungry economy, China became the top importer of oil in 2017. The Middle East, flush with oil, is a logical prime target for Beijing's money. At the same time, it's seething with internal conflict, and some of the strings of its tangled politics extend far across its borders, to Russia, the US, and Europe. China's non-interference policies seek to dodge those commitments. "We should treat each other frankly, not fear differences, not avoid problems, and have ample discussion on each aspect of foreign policy and development strategy," Xi said. China's position in the Middle East remains pronouncedly neutral. It deals with every nation involved, regardless of conflicts and squabbles between them. Israel and Palestine, Saudi Arabia and Iran, are just some of the countries targeted by Beijing's current and previous forays into the Middle East. Beijing is getting away with this because, unlike other non-regional players, it stays away from politics and security, and only deals in economics, says Martin Jacques, a China expert and the author of When China Rules the World: The End of the Western World and the Birth of a New Global Order. "China is reluctant to get involved politically – you'll see that even though it's got very extensive involvement in Africa, it by and large doesn't start trying to influence what's happening in the country politically. This is very different from the West, and indeed very different from Russia," he says. "China above all sees things first and foremost in an economic context, not in a security context." However, protection of expanding interests in the region may require something more from Beijing than just flows of money, another expert argues. “One of discussed solutions is to set up oversea military bases,” Dr. Jinghan Zeng, Deputy Director of the Centre for Politics in Africa, Asia and the Middle East (AAME), said. Shoving money into the cracks left by regional wars to gain influence by helping to restore infrastructure has long been a tactic of the US, as evidenced by the wars in Iraq and Afghanistan. Now China is providing competition by stepping onto the same turf. Martin Jacques believes Middle Eastern states are particularly interested in China specifically because they feel American influence is diminishing. 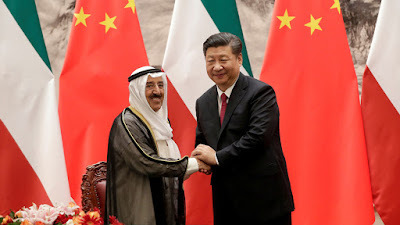 "The Arab countries have become increasingly interested in a relationship with China, not least because they can see America's presence in the Middle East beginning to decline," he said. “We may have arrived at a crucial juncture when China is moving from being a regional power with global interest to being a global power of its own right,” Yongjin Zhang Professor of International Politics, School of Sociology, Politics and International Studies at University of Bristol said. Just recently the US launched "the biggest trade war in economic history" against China, and while the new cash offensive in the Middle East is likely not a part of that war – just another operation of the pre-arranged Belt and Road campaign – it will be colored by the context. "This is a process which is not a function of the trade war, but of course, because the trade war looks like it's going to keep escalating, inevitably everything has to be seen in that context," Jacques said. Xi's address when introducing the new money package included a pledge to become "the keeper of peace and stability in the Middle East, the defender of equity and justice, promoter of joint development, and good friends that learn from each other." In the current climate, the "keeper of peace" part looks the most likely to give Beijing pause. Several significant cracks are running through the Middle East's political landscape: the Sunni-Shia divide with Saudi Arabia on one side and Iran on the other, the diplomatic crisis around Qatar, the war in Yemen and the tug-of-war for influence between the US and Russia. With negligible military presence (it has a single base in Djibouti, on the Horn of Africa) and little political clout, money remains China's only lever, and it can only go so far. "China understands its weakness," said political scientist Joseph Cheng, Professor Emeritus of Political Science at City University of Hong Kong. "It is in no position to offer a security umbrella for countries like Saudi Arabia, the Gulf Cooperation Council states and so on, it does not have respectable and effective projection capabilities like Russia demonstrated in its intervention in Syria." Instead, Beijing could try to secure the spot of a mediator, dealing with everyone and helping post-conflict restoration. "China is in no position to be a very effective peacekeeper. It certainly will try to facilitate peace negotiations, it certainly would like to contribute to post-war reconstruction, but there is an obvious limit to its influence in the M. East," says Professor Cheng.